Progression is a competitor of Guitar Pro for authoring guitar tabs for MacOS and Windows. And now an iPad version has been released! 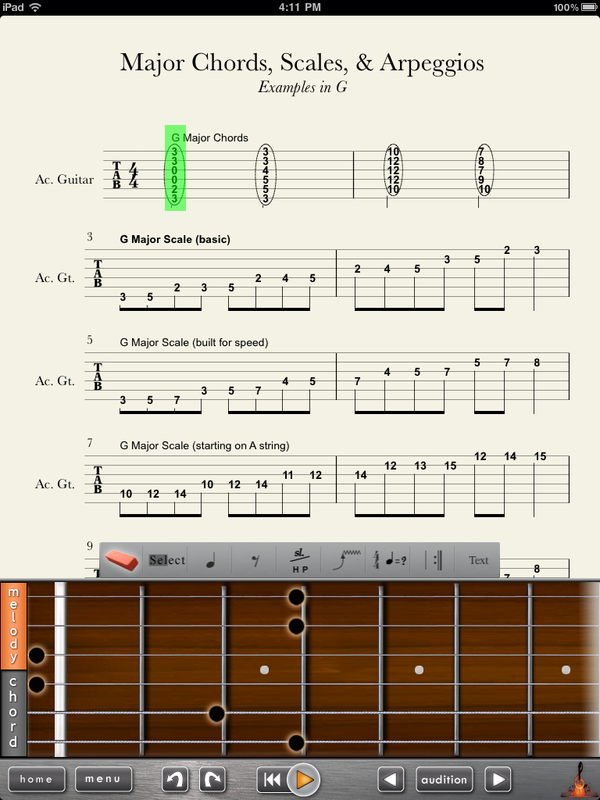 Having tried it out I have to say it is a much simpler alternative than working with tab notation i Guitar Pro on a computer (especially Guitar Pro 6 which is a bloated disaster). With Progression you just tap on the selected fret on a picture of the fretboard instead of typing in numbers – really easy. The app is currently free but lacks in a number of areas, most importantly it only has an acoustic guitar and a bass. A paid version is on its way, and I’m guessing it will contain an electric guitar and a drum kit. Progression’s only real drawback in my opinion is compatibility. Guitar Pro and its file format has become more or less a standard for tabs on the web, while Progression has its own format. You can export to PDF or WAV, but I’d rather export to GP5 or GPX.